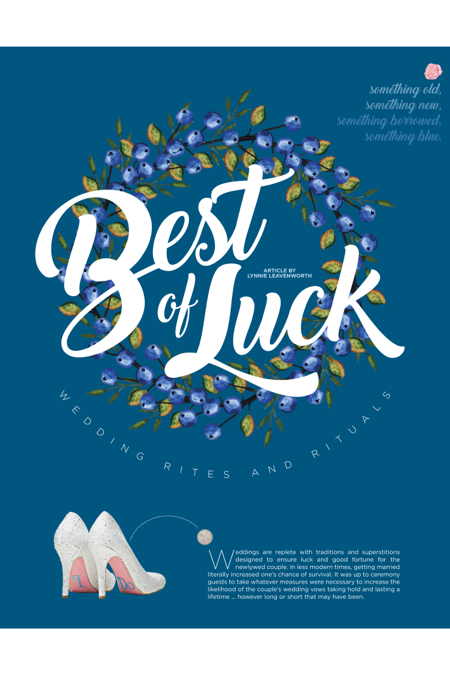 Weddings are replete with traditions and superstitions designed to ensure luck and good fortune for the newlywed couple. In less modern times, getting married literally increased one’s chance of survival. It was up to ceremony guests to take whatever measures were necessary to increase the likelihood of the couple’s wedding vows taking hold and lasting a lifetime … however long or short that may have been. Marrying for love was the stuff of legend. The motivation for marrying ran along a rather consistent path, whether in the Eastern, Western, Northern, or Southern hemisphere, whether nobility or peasant. A man with the strength to plant, plow and harvest a crop or fight off pillaging marauders was the kind of attractive that made him a great catch for any maiden in the market for a husband. A woman’s marriageability was based on equally pragmatic parameters: Could she bear offspring? Could she master all manner of womanly skills necessary to keep the home-fires burning? More children translated to more hands in the field or a greater likelihood of carrying on a blood line. Over time, societies and cultures have handed down customs designed to bring good fortune to the marrying couple. At times charming, or expensive, or painful, or humorous, each custom is nearly always rooted in superstition. The price of not abiding by certain rites was the threat of misfortune and bad luck forevermore. Wedding day rituals and rites have been, and still are, important ways in which family and friends participate in sending the bride and groom into their new life, wishing them good health, prosperity and a happy marriage. Wearing something old, something new, something borrowed, something blue, and a silver six pence in her shoe, is a bridal tradition that originated in England, where it is believed the rhyme was first heard in 1898; but the tradition dates back to the 14th Century. Commonly recited and practiced in modern day Europe and North America, the original purpose was to pass along the couple’s good fortune to their guests. Let’s break it down. The something old and something blue were intended to baffle the Evil Eye, which was believed to be the cause of a barren wife. The requisite blue was incorporated in the bride’s garter, which was made from a piece of her wedding dress. Guests believed that owning a piece of the bride’s dress would bring them good luck. The tale goes that men would get pretty rowdy in their quest for the garter and a piece of the groom’s good fortune, attempting to remove it from the bride themselves. Eventually the groom took that duty on to protect his new wife and tossed the lucky garter to the single men at the ceremony. The something borrowed gets a little weird. Fulfilling this superstition involved the bride borrowing a pair of undergarments from a woman who had been blessed with children. (And to think I only borrowed my grandmother’s pearls to fulfill my “something borrowed.”) The something new was usually represented by the bride’s dress; and the shiny six pence was a nod to the trousseau she would bring to the marriage. In Wales, grooms present their brides with Love Spoons—hand-carved wooden spoons, symbolizing his commitment to never let her go hungry. The Greeks have their money dance where guests pin cash to the couple’s clothing while they dance at the reception; and Greek brides tuck sugar cubes in their gloves to sweeten their union. Many Arab, African and Indian women adorn themselves with henna tattoos before their wedding to display their elegance and beauty. South Africans incorporate elephants, a symbol of luck, throughout their festivities. Egyptians pinch brides on their wedding day. In Holland, a pine tree is planted outside the newlyweds’ home, representing fertility and luck. In Scotland, the day before the wedding, they do what is called “blackening of the bride” and sometimes the groom, when all manner of gooey trash and ash are heaped on the couple, after which they are paraded about to ward off evil spirits. Jumping the broom is a tradition that began in mid-18th Century Britain, where new marriage laws made some unions illegal and the act of jumping a broomstick took the symbolic place of traditional wedding vows. The practice continues today in many African American wedding ceremonies. In the United States the practice dates back to times of slavery, when black newlyweds jumped over a broom to symbolize moving forward in their new lives. A Jewish couple is married under a chuppah—a canopy representing the home the couple will build together. A blessing over challah bread is given to start the wedding meal; and the breaking of a glass symbolizes the destruction of the Temple in Jerusalem some 2,000 years ago, along with wishing the couple mazel tov, a cheer of congratulations and good luck. It seems nothing is off-limits when it comes to ensuring a couple’s happy journey into the future. Most of the customs mentioned here date back hundreds, if not thousands of years, and yet wedding planners, and brides and grooms to this day are incorporating them into their ceremonies and receptions. “I had one family that sent out quilting squares to each family invited to the wedding,” said Kelli Corn of Kelli Corn Weddings & Events. “Each family quilted a square, and then the completed quilt was presented to the bride and groom.” Corn recommends sharing the information about some of the small gestures or special rites incorporated in the wedding day with guest in a program or display to bring everyone in on all the unique details of the day. Whether the groom is wearing his great uncle’s cuff links or the bride is incorporating some of her family’s cultural traditions, it creates a sense of shared intimacy.